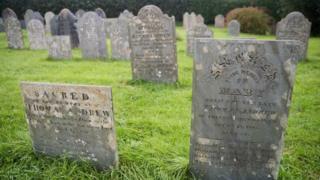 Bereaved families in England and Wales are struggling to register relatives' deaths within official time limits, figures reveal. In 2015/16, 187,605 deaths were registered after the five-day legal limit, a 70% rise on 2011/12, General Register Office (GRO) figures show. Cuts to council budgets are among the reasons, the National Association of Funeral Directors (NAFD) said. The Local Government Association (LGA) said councils were tackling the delays. An individual who intentionally fails to inform, or refuses to provide information to a registrar about a death can be fined £200. But under the law, this would be avoided if delays in registering the death were caused by a council or because the medical certificate was issued late by a doctor or coroner. Grieving families who have experienced problems say the delays have caused further stress and heartache. "After my mother died it was horrendous. I had to wait a fortnight before I could get an appointment with the council to register the death," said Graham Morgan, from Cinderford, Gloucestershire. "We'd arranged my mother's funeral not expecting it would take so long to register the death. Without the registration certificate I began to panic that I'd have to cancel the funeral. "I was already feeling incredibly low because of the sense of loss and then to have all the added stress of trying to register the death put me in a right state." The figures, obtained from the GRO by the BBC in a Freedom of Information request, also show the total number of deaths registered increased by 6% between 2011/12 and 2015/16. They indicate there were 110,664 delayed registrations in 2011/12. The increase in delayed registrations is affected by councils making cuts to administrative staff, along with the conclusion of post-mortem examinations and inquests taking longer to be reached, the NAFD said. The NAFD said its own research showed that in some areas it can now take up to three weeks to officially register a death. "There are councils who have cut the number of registrars they have available to register a death," Alison Crake, president of NAFD, said. "And whilst there are some families delaying the registration process out of personal choice, we are finding that overall the registration process is taking longer." Analysing the GRO data, BBC News also found 97% of councils in England and Wales saw an increase in the number of deaths being registered over the five day limit, between 2011/12 and 2015/16. Overall, one in every three deaths was registered over the five day limit in 2015/16. Councillor Ian Gillies, the LGA's bereavement services lead, said: "Various external factors have increasingly contributed to delays in registering deaths. "These include increased demand in appointments, deaths referred to coroners which include those subject to post-mortems and delays in obtaining the necessary paperwork from the certifying doctor or coroner. "Councils are working with the General Register Office to reduce delays."